Question: When is a Vitamin not a Vitamin? Answer: When it is “Vitamin D”. This is a high-quality, single-channel audio file of the sort Leo normally provides for use with any media player that can handle standard MP3 files. Since we're just talking, 64kbps can be overkill (though it certainly does sound the best). But if you'd prefer a smaller file, this one is probably all you need. Since the audio now easily fits onto a standard audio CD, and since you might wish to share it with non-iPod or mp3 playing people, this ZIP file contains a standard Cue/Bin file set that can be loaded and burned by most CD burning software, to produce a standard audio CD, making sharing the content as easy as possible. If you want the podcast content in any other format, this file provides the raw, full-fidelity, stereo WAV file from which all of the foregoing files were created. It can be packaged or compressed in any way you wish. If you were to read this page without any additional introduction, from the top, you would doubtless wonder why I was making such a big deal about a "Vitamin." Then come back up here to the top of the page and read from the beginning, knowing a bit more about what's in store. And once you get back down to the clinical studies details you'll have a much better sense for why you're there and why they probably matter. And thanks for checking this out! I hope you'll be glad you did. So just a very tiny bit of this stuff goes a long way! When human skin is exposed to sufficiently powerful ultraviolet (UV) radiation from sunlight, a form of cholesterol contained in our skin (“7-dehydrocholesterol”) is converted into the precursor of Vitamin D, called “cholecalciferol”. This is then converted by our liver into the inactive bulk storage form of vitamin D that blood tests measure (“25-hydroxyvitamin D”). Although Vitamin D is present in limited amounts in cod liver oil and some fatty fish (salmon, mackerel and tuna), it is essentially unavailable in metabolically useful quantities from dietary sources. “Vitamin D” was misnamed when it was first discovered hundreds of years ago, before we knew where it came from or how it was made. By definition, it is not a “vitamin” because vitamins are not produced endogenously (internally), they must be obtained exogenously (externally) from dietary food sources. and thus assumed to be available in sufficient quantity through our diet. “Vitamin D” isn't even a nutrient! It comes from the sun, not from nutrition. Vitamin D Science has another problem: Vitamin D is very inexpensive and cannot be patented. Large and long, many-year double-blind placebo-controlled clinical trials with many participants can easily cost millions of dollars. But since Vitamin D is technically free (just go stand in the sun) or super-inexpensive (about 2.4 cents per day as a dietary supplement), no commercial pharmaceutical company wants to even think about it. Unlike synthetic chemicals to lower cholesterol, control blood sugar, lower high blood pressure or improve sexual performance, no large pharmaceutical company can make money selling vitamin D. And as the studies below demonstrate over and over, maintaining adequate levels of Vitamin D throughout a lifetime is both simple and inexpensive. Prospective study after study shows that Vitamin D is apparently highly effective in preventing many of the health problems that big pharmaceutical firms have invested millions of dollars in developing expensive drugs to cure. This puts such companies in the admittedly awkward position of not being big fans of health. Vitamin D inexpensively promotes health. So only University and some hospital affiliated researchers, with comparatively limited budgets, have any interest in exploring the health benefits of Vitamin D. And even when they, again and again, demonstrate surprising benefits from maintaining higher levels of vitamin D ... who's going to market and sell that information? Once again, there's no money in it. So, once again, although all of these professionally prepared reports and studies are freely available for access, download, and printing on the Internet, the general public never knows about is since there's no one running expensive prime-time commercials to sell it. We see expensive commercials every night during prime time for expensive and patented pharmaceuticals that allow older men to urinate more easily and less often, but we never see any similar advertisements mentioning that study after study has shown that simply (and inexpensively) maintaining sufficient levels of Vitamin D can work to prevent rickets (that's well known) but also 17 types of cancer including pancreatic, colon/rectal, stomach, prostate, lung, breast, bladder, uterine, espousal, kidney, ovarian, multiple myeloma, non-hodgkin's lymphoma, and leukemia, lower blood pressure, improve immune system function (prevents colds and flu), autoimmune function, inflammation, multiple sclerosis, autism, allergies, preeclampsia, both type 1 and type 2 diabetes, osteoporosis (also well known) depression, muscle and bone weakness and generalized pain. Looking at that long list of problems above, you may wonder how something, anything, could possibly “cure” all of those very different disease conditions. But that's thinking about Vitamin D backwards. Vitamin D doesn't “cure” anything. NONE of those things are supposed to go wrong in the first place. So Vitamin D simply allows our bodies to work the way they were designed to . . . because our bodies were designed to have much more Vitamin D circulating through them than most indoor-living Westerners do today. The human race evolved, developed and emerged in sub-Saharan equatorial East Africa where, year round without seasons, we received the sunlight we needed everyday for our skin to manufacture all of the Vitamin D hormone we required from our skin's natural cholesterol. When we migrated away from the equator, natural selection quickly eliminated most of the melanin pigmentation from our skin in an attempt to compensate for the much weaker levels of UV radiation available for making Vitamin D. But then we went indoors and have been inadvertently starving our bodies of Vitamin D ever since. After reading the original medical research studies provided below, I wondered what the popular press had to say about Vitamin D. So I purchased a number of inexpensive books to review. 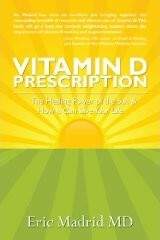 My favorite from among them is this book the “Vitamin D Prescription” that I recommend without hesitation. It very fairly and accurately recaps and summarizes in non-clinical non-medical language, all of the latest original research and findings regarding Vitamin D. If you were to read all of the fundamental research first, as I have, you would recognize it all in this book, but in much more readily accessible form. If you would like something more readily digestible, or if you want something for a family member or friend, this might be perfect. Life Extension Foundation — “LEF” offers retail blood testing through their affiliation with LabCorp, a national clinical testing laboratory with facilities everywhere. (There are four near me that I had to choose among.) After purchasing the test(s) online, you receive a packet send via postal mail or faster ways if you prefer. That is taken to the lab which draws blood and processes the tests. The results are electronically returned to LEF who makes them available to you online, by eMail, postal mail or fax (in any combination). Here's the link to Life Extension's Vitamin D (25-hydroxy) test. Since it is (as of this writing) $62.67 for non-members or $47.00 for members, with membership costing $75 per year, if you think you might be taking multiple tests, as I have been during my experiments, joining to get the lower price pays for itself pretty quickly. Here's the link to all of Life Extension's extensive selection of tests. Again, since the offer substantial discounts to members, becoming one can reduce the cost of even one expensive blood test. Grass Root Health — I recently learned of this site, and their $40 "prick your finger at home" Vitamin D blood testing kit. SO I can't vouch for them in any way, but I wanted to pass on the information in case it might be useful to anyone. extremely high doses daily for many months !!! Our skin's natural sunlight-driven production of Vitamin D is internally regulated to limit the maximum rate at which Vitamin D can be produced. It has been estimated that approximately 10,000 to 20,000 IU of Vitamin D is generated by 20 to 30 minutes of full body exposure in direct overhead sunlight. Beyond that, continued exposure begins to degrade any additional Vitamin D produced to limit its total daily production. It is, therefore, impossible to overdose on Vitamin D obtained from sunlight, and there is no record that it has ever happened. But no such limitation exists when high-potency Vitamin D supplements are ingested orally. Although it is quite difficult to overdose on Vitamin D, YOU MUST TREAT IT WITH RESPECT. Its value lies in its power, but you want it to improve and not compromise your health. Follow the labels on supplements, educate yourself about dosages, if at all possible test your blood's Vitamin D level, check with your doctor, and be responsible. John Jacob Cannell, M.D. and executive director of the Vitamin D Council has this to say about Vitamin D Toxicity. I have been using the web site “iHerb.com” for many years and I recommend them without hesitation. An advantage for me is that they are located close enough that UPS Ground delivery is overnight, but I would use them if they were on the other side of the moon. Their service is perfect, their web site works well, and — most importantly — their prices are consistently the lowest anywhere. This is the Vitamin D3 I had chosen for my own use, and it's what I had been recommending to others. I have since switched to the Vitamin D from “Healthy Origins” (see below) because it is even less expensive than Now Foods and they are an equally good and trusted supplier. Because Vitamin D3 (Cholecalciferol) is so potent and fat soluble, the capsules are tiny, filled with olive oil, and easy to swallow. The label instructs to take one 5,000 IU capsule every three days, for an average daily dosage of 5000/3 = 1667 IU/day. Since the 120 capsule bottle costs $8.80, taking one capsule every third day will last one full year, which is impossible to beat for the price. “Day skipping” works well with Vitamin D3, since after being quickly metabolized by your liver into “25-hydroxy vitamin D”, that fat soluble metabolite has a half-life of at least three weeks in the body. So whatever regimen you choose will quickly "average out" to a nice even level in your blood. Although you should never go “off label” to obtain a higher dosage without the advice of a doctor and/or keeping an eye on your important blood levels, especially calcium, this high-potency per capsule does make obtaining higher daily dosages extremely convenient. This Vitamin D3 appeared on the iHerb site in August 2009, right around the time of the Vitamin D podcast. It's label suggests taking one per day which, frankly, even though it's three times the dosage suggested by the Now Foods label, is not something I would disagree with so long as its users always act responsibly with making sure there are no problems, rare as they might be, with hypercalcemia, which could affect some people who would be genetically sensitive to higher intakes of Vitamin D. PLEASE remember that Vitamin D can definitely be toxic when taken in large doses over an extended period of time. There are so many available potencies and capsule counts of Healthy Origins Vitamin D3 that rather than listing them all, here's a search link of iHerb.com for: “Healthy Origins Vitamin D3” which should give you a page showing all of the many options of 1200, 2400, and 5000 IU Vitamin D3. This is the doctor (MD & Psychiatrist) who I mentioned during the podcast as working at the Atascadero State Mental Hospital where he had all of the patients on Vitamin D for its beneficial effects on their emotional state. During that time, an extremely serious influenza (flu) outbreak swept the hospital, causing the quarantining of the wards surrounding his on every side . . . while not one of his patients became sick, despite having had ample pre-quarantine contact with the adjoining wards. Today, everyone in the hospital takes vitamin D. Doctor Cannell is also the founder of The Vitamin D Council and, as you can probably tell from the video, he appears to really know his stuff . . .
A news blurb by Science Central, Inc. It is not my intention to bury you in media. But seeing samples from many different sources helps make the point that the awakening to the Vitamin D problem is happening all over and is not an isolated “crackpot” phenomenon. THIS LINK will take you to the Living on Earth program for August 28th,2009 titled “Skin Color and Vitamin D”. Note that the page also contains a complete textual transcript of the audio file for anyone who would also like to have that. If at some future time that original source link above fails to work, you can download the original audio file in MP3 format with this local link hosted by GRC. The following collection of PDF files were gathered from freely available public Internet sources. Nothing was paid for — though some digging was sometimes required to locate a freely downloadable version of an article that was available only for purchase elsewhere — and all copyrights have been left intact and unchanged. So you should feel free to print or share anything here with anyone else. Also, the URLs of these documents are stable. They will not be changing or going away for the foreseeable future. This provides a good ultra-conservative take on the U.S. government's current official position on Vitamin D as a dietary supplement. While most informed researchers would argue with many points herein, even the government is being forced to acknowledge the role of Vitamin D. Check out the section on Cancer. This review article provides a brief summary of the metabolism of Vitamin D, followed by a broad overview of the increasing number of roles Vitamin D is believed to have on health. 2007 - The New England Journal of Medicine — 16 pages — by Michael F. Holick, M.D., Ph.D.
Michael Holick is one of the doctors who is most responsible for helping raise awareness of need for more attention on Vitamin D. You will see his work cited throughout these articles and studies. This review article provides great background on Vitamin D metabolism (with some nice color diagrams) and an overview of the many roles played by the hormone. Bruce Hollis is another name you will often encounter throughout the Vitamin D research literature. This article provides some great background for the discussion of adequate and healthy levels of Vitamin D.
Reinhold Vieth, and this article, is more than ten years old, but it's one of the most influential early papers written. If you're finding yourself fascinated by the topic and wanting to know more, this paper is a terrific source. 2006 - Mayo Clinic Proceedings — 21 pages — by Michael F. Holick, M.D., Ph.D. This additional piece by Michael Holick provides additional background and summarizes the results of many previous studies into Vitamin D.
2004 - American Journal of Clinical Nutrition — 11 pages — by Michael F. Holick, M.D., Ph.D. This article provides additional background about Vitamin D and also discusses the widely observed latitudinal variations in diseases believed to be related to Vitamin D deficiency. 2009 - Journal of American Physicians and Surgeons — 8 pages — Joel M. Kauffman, Ph.D. This very recent summary report (Summer of 2009) perfectly sums up the case for raising and maintaining higher serum levels of Vitamin D. Supplementation is used throughout most studies, and it works — literal — wonders.